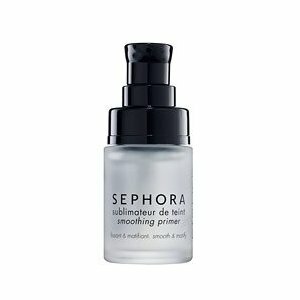 During my last trip to Sephora I was given the Sephora Collection Smoothing Primer as a gift with purchase. I was a bit naive to what exactly a primer was so the sales associate told me that it was great to use as a base for oily skin. Not only would it help to set the makeup, but it would create a smoother foundation for makeup application and help you to keep your "face" longer. I don't have oily skin and actually prefer a dewy look, but my mother is the complete opposite. I know that she has issues with her makeup starting to run a bit due to the oil from her pores throughout the day so I wanted to use her as my guinea pig. She's swears by powder and never heard of primer before so I knew this product would either sink or sail in a major way. Well, the verdict is in and my mother LOVED the product!!!!! I was acting like a semi Nazi making sure she didn't apply any moisturizer to her face prior to the primer because I didn't want to taint the process or the possible results. Within minutes of applying the primer and then her foundation the results were quite obvious. She commented that her skin felt silky and smooth and it actually looked more even with a nice matte finish. After working a 12 hr day my mom also raved that she didn't have to do any touch-ups (she's usually doing a few throughout the day) and her oil control was near non-existent. From reading some of the reviews on the Sephora site I know many have compared this product to a primer that Smashbox puts out, but much more affordable. 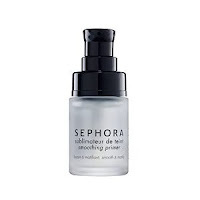 The Sephora Collection Smoothing Primers sells for $18 and a little does go a long way. Do any of you guys have experience using primers? Which brands do you like?